The majority of central Alberta, including Edmonton and areas just north of Calgary, are going to be hit hard by snow and freezing rain Thursday night. If you didn't get your winter tires on last week, now is most definitely the time. A large swath of north and central Alberta, including Edmonton and areas just north of Calgary, are going to be hit hard by snow and freezing rain Thursday night and Friday morning. As much as 15 centimetres is expected in areas now under a heavy snowfall warning including Bonnyville, St. Paul, Cold Lake and Lac La Biche. Fort Saskatchewan, Vegreville, Redwater and Smoky Lake are also under a heavy snowfall warning. Environment Canada has issued a winter storm warning for Leduc, Camrose, Wetaskiwin, Tofield, Lloydminster, Wainwright, Vermilion and Provost. Those areas are expecting snowfall amounts from 10 to 15 centimetres along with freezing rain and ice pellets. The worst weather is expected to arrive Friday morning. An area of snow will develop in the Peace Country this afternoon, moving eastward into Saskatchewan by evening. It will dump 2-5 centimetres of snow in areas north of Edmonton. Environment Canada warns communities south of Edmonton that freezing rain will move into the Rocky Mountain House and Airdrie regions and will "intensify" as it makes it way to Lloydminster. 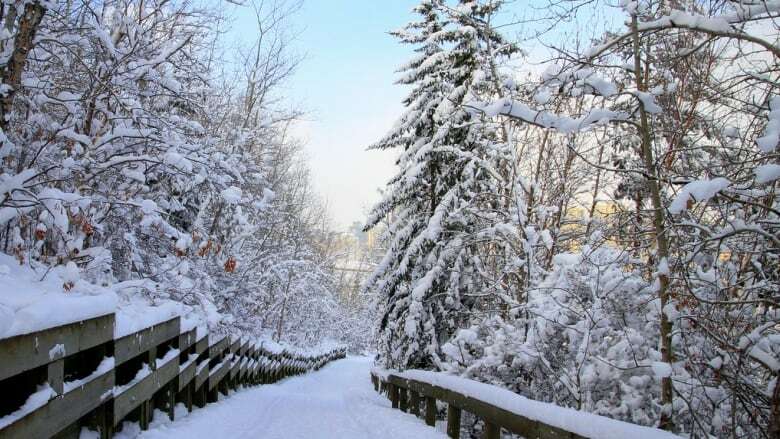 If you snap any pictures of the incoming winter wonderland please send them to WebEdmonton@cbc.ca.